In The Idiot, the saintly Prince Myshkin returns to Russia from a Swiss sanatorium and finds himself a stranger in a society obsessed with wealth, power, and sexual conquest. He soon becomes entangled in a love triangle with a notorious kept woman, Nastasya, and a beautiful young girl, Aglaya. Extortion and scandal escalate to murder, as Dostoevsky’s “positively beautiful man” clashes with the emptiness of a society that cannot accommodate his innocence and moral idealism. 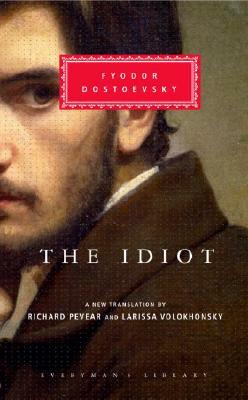 The Idiot is both a powerful indictment of that society and a rich and gripping masterpiece. From award-winning translators, a masterful new translation–never before published–of the novel in which Fyodor Dostoevsky set out to portray a truly beautiful soul. Fyodor Mikailovich Dostoevsky’s life was as dark and dramatic as the great novels he wrote. He was born in Moscow in 1821. A short first novel, Poor Folk (1846) brought him instant success, but his writing career was cut short by his arrest for alleged subversion against Tsar Nicholas I in 1849. In prison he was given the “silent treatment” for eight months (guards even wore velvet soled boots) before he was led in front a firing squad. Dressed in a death shroud, he faced an open grave and awaited execution, when suddenly, an order arrived commuting his sentence. He then spent four years at hard labor in a Siberian prison, where he began to suffer from epilepsy, and he returned to St. Petersburg only a full ten years after he had left in chains. His prison experiences coupled with his conversion to a profoundly religious philosophy formed the basis for his great novels. But it was his fortuitous marriage to Anna Snitkina, following a period of utter destitution brought about by his compulsive gambling, that gave Dostoevsky the emotional stability to complete Crime and Punishment (1866), The Idiot (1868-69), The Possessed (1871-72),and The Brothers Karamazov (1879-80). When Dostoevsky died in 1881, he left a legacy of masterworks that influenced the great thinkers and writers of the Western world and immortalized him as a giant among writers of world literature.